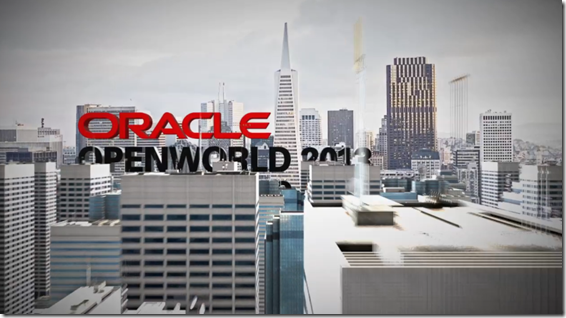 Oracle OpenWorld is a monster event – 10Ks of attendees, thousands of sessions and 100Ks of private conversations that all help convey and define the message about Oracle’s strategy and the roadmap for its close to 4000 thousand products. Concurrent with OOW is the JavaOne conference that – at a slightly smaller scale – does the same thing for the world of the Java platform, the JVM and the Java community. AMIS each year sends a substantial delegation to attend and contribute to the conference. We speak in many sessions, ask questions in even more and do our utmost to gather information, digest it and distill the real meaning and relevant details. We have just completed our yearly review of the Oracle OpenWorld and JavaOne 2013 conferences: a 60-page PDF document that answers the ultimate question about life, the universe and everything [Oracle]. This white paper describes the major transitions that the industry at large and Oracle in specific is going through. It explains what these transitions mean to Oracle, cause in terms of product evolution and will result in for the users. The major product announcements are listed and commented on. The roadmaps for the most relevant product lines (relevant for platform administrators and developers that is) are summarized. In addition, each of our dozen OOW attendees brings their own expertise and personal interest to the table and this multi-colored background shines through in the white paper. There is something there for almost everyone. Expect sections on WebLogic, XML DB, Provisioning, ADF, BPM Suite, User Experience, Cloud, Oracle Applications, APEX, Forms (well, a tiny little bit), SOA Suite, SQL, Java, Lambda expressions, Oracle Application Testing Suite, Mission Control, WebCenter, mobile, Big Data (and small events), the internet of things, Maven and much more. Note: we’d love to hear your feedback on this paper! 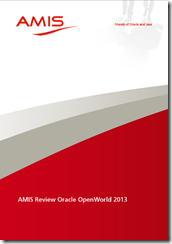 Download the AMIS Review of Oracle OpenWorld 2013 White Paper.